Unknown to the coin collecting community in 2012 the Royal Australian Mint in conjunction with Australia Post and the Australian Football League (AFL) released a commemorative 1 dollar coin which was distributed as a gift at AFL corporate functions in different packaging to what we’ve already seen this coin in. 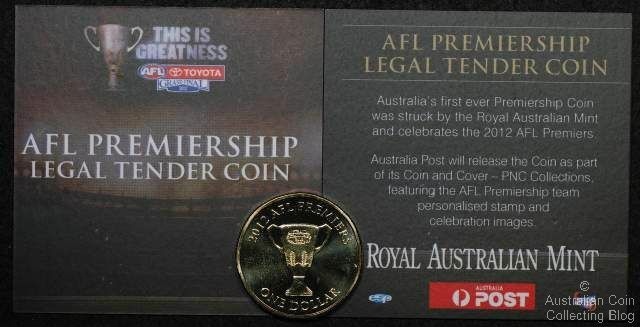 Officially released to stamp and coin collectors in a pnc (philatelic numismatic cover) this coin appears again with a small card in a sealed bag and was given away as memorabilia of the AFL 2012 season at official AFL corporate functions. Update 2015: This special packaging issue appears for the first time in the 22nd (2015) edition of the McDonald’s pocket guide to Australian Coins and Banknotes catalogue. With an issue of 2,500 of these corporate gift packs it’s rare to see them for sale.